Bread made without yeast is called quick bread or soda bread. In regular yeast bread, the small air holes that create lightness and texture are the result of the gases released by the yeast. In quick bread, the air holes are made by a chemical reaction of baking soda and an acidic ingredient, usually buttermilk, sour cream or vinegar. The most common white quick bread is Irish soda bread. It is a quick and easy way to put a loaf of bread on the table. Combine the flour, sugar, baking powder and salt in one bowl. Beat the eggs in a second bowl, and add the milk and vinegar to the eggs. Beat until combined. Add the egg mixture to the flour mixture. Stir just until combined. Grease the loaf pan with butter, and pour the batter into the loaf pan. Bake for one hour. Remove the pan from the oven. Remove the bread from the pan, and cool it on a cooling rack. If you like raisins, add 1/2 cup of them after mixing the batter. 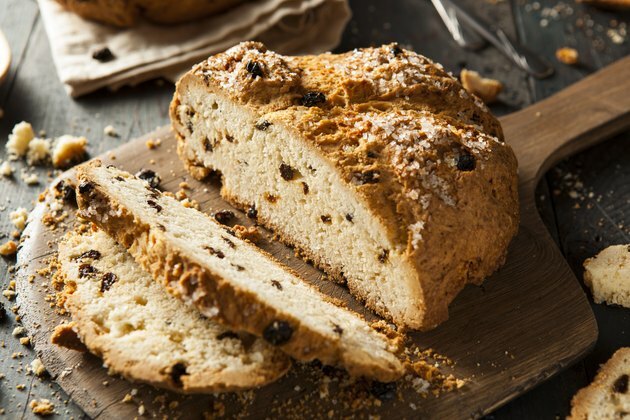 Raisins in Irish soda bread are not traditional, but they do make a tasty bread. Soda bread doesn't have the same texture as yeast bread. It doesn't hold together well enough for sandwiches. It also doesn't keep very well. The best use for soda bread is as an accompaniment to soups or salads a half-hour to an hour after it is baked. If you are going to keep it for more than a few hours, wrap the bread in aluminum foil immediately after cooling. Doing so improves both the texture and the taste.